These elegant, thin cookies are light and crispy, similar to a traditional tuiles. They are also very quick and hit the spot with a scoop of low-carb ice cream sandwiched between two. Pre heat the oven to 325F/170c. Line three baking sheets with parchment and cut three additional sheets to the same size. In a large bowl, mix the almond flour, coconut flour, and Sola® sweetener together. Add the egg whites, and almond extract, and mix well, until a soft dough is formed. Place the dough into the refrigerator for 10 minutes to firm up slightly. Divide the dough into 15 evenly sized pieces and roll into small balls. You'll need to use three separate baking trays or cook the cookies in three batches, you want 5 cookies per tray. Place one sheet of parchment paper onto a clean work surface and place five balls of dough on top, evenly spaced. Place the second sheet of baking parchment on top of the dough balls, and use a rolling pin to roll out the dough into very thin discs as thick as two pennies. Remove the top sheet of parchment and then place the cookies in the oven to bake for 12 - 15 minutes, until golden brown. Place the cookies onto a wire rack; they will crisp up as they cool. 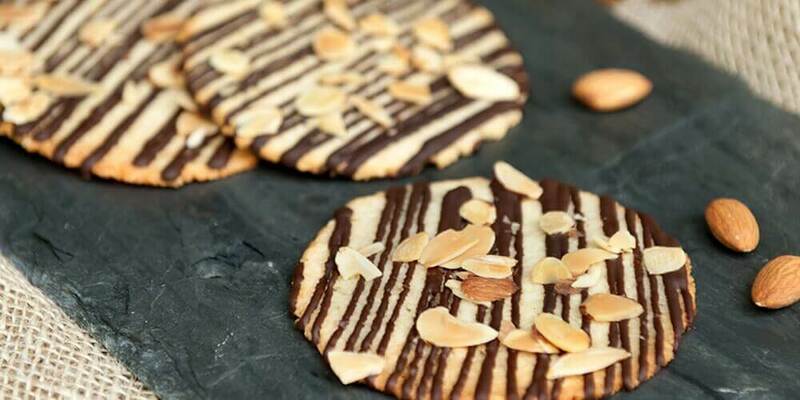 Decorate the almond thins with a drizzle of melted chocolate and a light sprinkling of toasted almonds. To make hazelnut thins, use ¾ cup (70 g) of almond flour and add ¾ cup (70 g) of finely ground hazelnut flour.